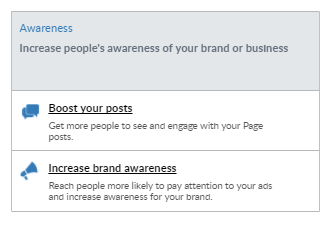 TL;DR Until now, Facebook ads typically fell into one of two categories—brand awareness or direct response — each of which has different objectives. While there are several optimization capabilities for campaigns with a direct response objective, like website conversion or app installs, Facebook offered fewer options for brand campaigns. That’s changing now with a new recently introduced objective – Brand Awareness. Its aim is very specific. Brand awareness is not designed to lead new visitors to the website, nor to increase post engagement or direct sales. Its purpose is simply to help advertisers to find the audiences most likely to recall their ads. It takes two primary factors into account: attention and reach. Imagine that you are running a campaign on delicious beverage and your goal is NOT to increase website visitors and you don´t need to know users’ feedback such as if they like this beverage etc. Your goal is to raise people’s attention of your brand so that when they are shopping few days later, they will remember your brand which will increase the chance they will buy it. Does it sound vague and difficult to measure results of such a campaign? Facebook team analyzed hundreds of brand campaigns and found that the longer someone spends with an ad, the more likely they are to remember what they’ve seen. This new metric is called “Estimate Recall Lift” which covers estimate number of people who are most likely to remember your ad for 2 days, if you ask them. It combines reach, time spent on ad and historical behavior (if people pay attention to ads and remember them). What was the intention to start a new objective with not precisely specified value? Companies are highly focused on quality content. Since it doesn’t make sense to create content which nobody will see, companies invest their marketing budgets into TV or other offline channels such as magazines or newspapers. Facebook wanted to offer online alternative but recognized that on-site metrics like cost-per-like and cost-per-engagement didn’t provide a complete picture of media effectiveness. Users who engaged or clicked through the ad thanks to a nice creative, don´t need to fulfill the goal – increase brand awareness leading to sales. Therefore Facebook along with Nielsen agency struggled to find a solution for a raising question – how to reach the most relevant users and offer a metric which can clearly show benefits of brand awareness ads on Facebook. They created all series of research on how people perceive ads and what other elements influence them. Facebook determined that it was not only campaign reach, but also dwell time on an ad, that consistently drove ad recall across all verticals. Unlike clicks, which have limited predictive ability due to the small percentage of an audience that interacts with ads on Facebook, dwell time is broadly predictive of behavior even among users who don’t click. These studies were based on surveys which were given to two groups of users – control group and group exposed to Facebook campaign. The survey questions were related to ad recall, purchase intent, brand favorability and similar. Based on these differences, they created a metric “recall lift” as mentioned above. We tested 3 different ad objectives on the same audience: page post engagement, website clicks and brand awareness. We chose website clicks objective because BA campaign also leads users to the website and they are visually identical. The result was unequivocal. BA campaign had almost twice bigger reach. Although numbers of website clicks or engagement were minimal. With this kind of ad, you really need to have stroke creatives with effective wording. Besides “emotionality” and “entertainment”, you need to focus on a clear tagging of your brand. It can be a logo or a unique element such as bottle shape, colors etc. Show your brand personality, in case it has it, brand awareness is a good way to get effective reach. When creating ads in Get Visitors or Boost Post, choose Brand Awareness objective in Campaign settings/Conversion. Brand awareness/Impressions – We’ll serve your ads to people most likely to pay attention to them. Reach/Impressions – We’ll serve your ads to the maximum number of people. Set up time interval which allows you to control duration and frequency of your ad. Default option: Facebook or Instagram will serve ad every 1 day, with no more than 1 impression per user. Facebook also does not allow to change Interval Days and max. Frequency values. You can change only bid value. you cannot create right hand side ads for brand awareness. you can use targeting based on OS, not by exact device. you cannot change an optimization goal for ad set under the brand awareness objective. So don´t wait and give it a try! Imagine that you are running a campaign on delicious beverage and your goal is NOT to increase website visitors and you don´t need to know users’ feedback such as if they like this beverage etc.